Best Easy Brownies require just 1 bowl, no mixer, and take less than an hour to make! They're tall, fudgy, and chewy with that thin shiny crust on top and tons of chocolate flavor. Taste: Tons of chocolate flavor with the perfect amount of sweetness! Texture: Tall, rich, fudgy, chewy (especially at the edges), with hints of gooey chocolate chips throughout. Ease: Super quick and easy! Who needs box mix when you have this recipe? Pros: Easy and absolutely delightful homemade brownie recipe. Cons: None! If you don’t want to chop the semisweet chocolate, you could always use chocolate chips instead to make it even simpler. Would I make this again? Absolutely, I’ve already made this one several times. Homemade brownies are just so much better than box mix. Especially with this Best Easy Brownies recipe. The chocolate flavor is just unparalleled! That’s why I’m SO excited to share this recipe with you. I was inspired to create it randomly last week when an intense chocolate craving hit. Within a few days I had the recipe nailed and I realized I just had to film a recipe video to show you exactly how to make these babies. These brownies did not last long at our house! They’re especially good with ice cream. Brownies may seem super simple, but there’s some interesting things happening behind the scenes with the ingredients and techniques. 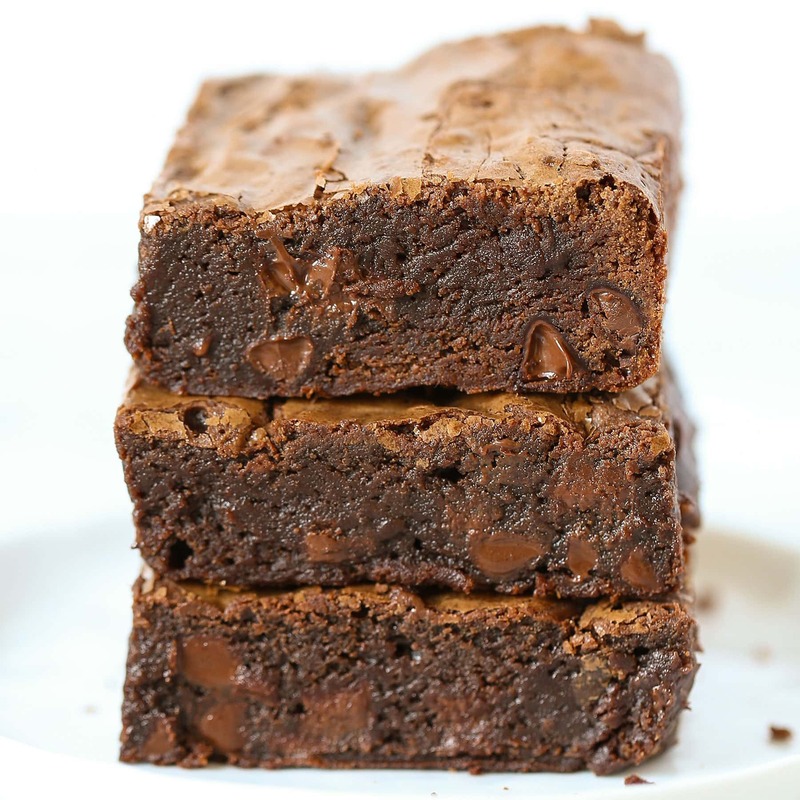 Achieving tall, fudgy, chewy, and moist brownies with that shiny crust on top is totally doable but requires some understanding of how baking works. So be sure to watch the video before you give this recipe a try. I crammed in as many tips and tricks as I could. I didn’t quite realize it until the camera was on, but I have a LOT to say about brownies. Almost as much as I do about cookies. So if you’re curious about how to really perfect your brownies, check out the tips below. I also tried to answer any questions I thought you might have below. 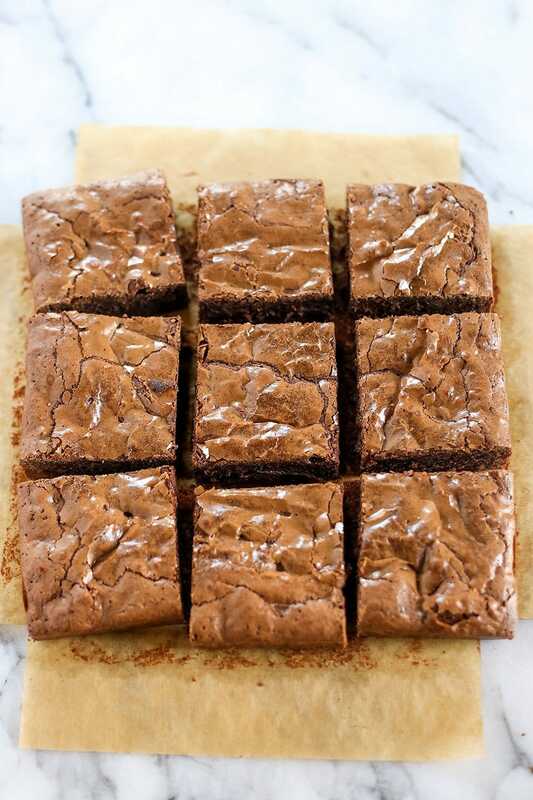 You know that tissue-thin shiny crust on top of brownies that we all love and want? It’s easier to achieve than you might think. I show you how to do this in detail in the video above. But the basic idea is to beat the eggs and sugar in the batter extremely well to create a sort of foam. I discovered that I can short cut my way to that shiny crust by whisking the the wet ingredients extremely well, until the batter itself is ultra smooth and shiny. Although my goal for this recipe was to make EASY homemade brownies, I still wanted them to be chewy. For the first batches I made I found the brownies to be delicious, but lacking a bit of that chewiness I wanted. So I added an extra egg yolk to the recipe and it was the perfect simple way to achieve that extra chewy texture. Why the yolk? The fat and protein in the yolk helps to create a rich and chewy texture. If you don’t want that chewiness, or don’t want to deal with adding an extra yolk, feel free to skip it. For this recipe I highly recommend using a metal baking pan. I like this baking pan, or any quality metal baking pan that isn’t too dark in color. The darker the color, the more likely you are to burn the edges or have dry edges. Glass or ceramic baking pans will take LONGER to bake these brownies, and the texture may become more dense. I like to line my pan with parchment or foil, leaving an overhang so I can easily lift out the entire pan of brownies to cut and serve. Do NOT overbake brownies. There should absolutely be moist crumbs attached to a tester by the end of the baking time. Err on the side of underbaking here. 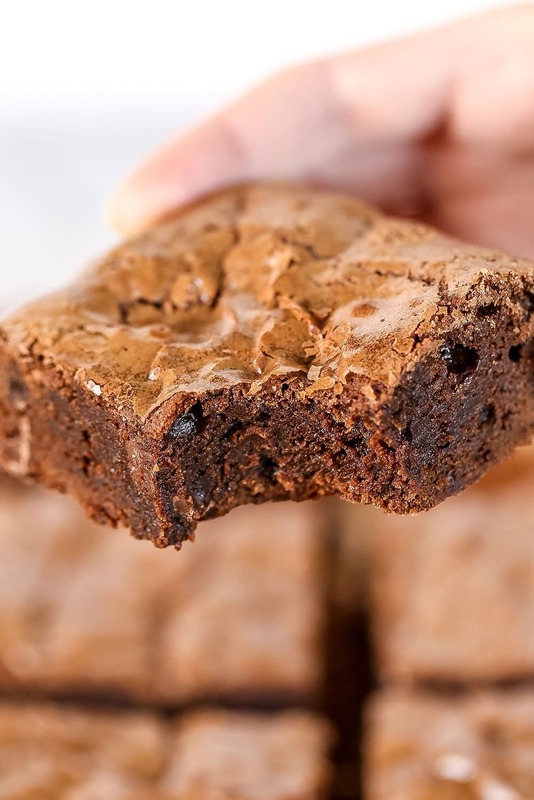 The brownies definitely taste best the day they are baked, but can be stored in an airtight container for up to 2 days at room temperature or up to 4 days in the fridge. They are even more fudgy when they’re chilled. You can microwave them for a bit to serve them warm too. It’s up to you! Add in eggs, yolk, and vanilla extract and whisk for about 1 minute, or until very well combined. This helps create that shiny crust on top. Use a rubber spatula to stir in flour, cocoa powder, and salt until just combined. Stir in the chocolate chips. Pour into prepared pan and smooth out. Bake in the preheated oven for 25 to 30 minutes, or until a toothpick entered in the center comes out with moist crumbs. Let cool in pan 30 minutes before slicing. *You can make this recipe even easier by using chocolate chips instead of chopping baking chocolate. Simply use 2/3 cup semisweet chocolate chips in place of the chopped chocolate. Just be sure to use high quality chips! *Be sure to weigh or use the spoon-and-level method to measure your flour & cocoa. Too much will lead to dry, dense, or cakey brownies. Hi! I love chocolate anything, but I have a friend who cannot eat chocolate chocolate. She ONLY can eat white chocolate sweets. Do you have a similar recipe for white chocolate brownies, by any chance? Can I use dutch processed cocoa (I only have those at the moment)? These turned out so yummy! We ate the whole pan! these were great, but it was a bit buttery. like too oily. what should i do ??? like add some more flour? Made a double batch of these brownies and sprinkled the top with coarse sea salt before baking, turned out so delicious. Thanks for a great recipie! hello tessa! This is my first time I make brownies and I did it with your recipe… wow amazing thanks! I live at high altitude (5000 feet). I followed the recipe exactly, making NO changes to any of the ingredients. The brownies came out most excellent !!! Very fudgy and chewy with the most chocolaty taste ever. I want to thank-you Tessa for also supplying the “weight in grams” for each ingredient as I always weigh my ingredients to get the right results. THANKS for sharing a terrific recipe. Oh wonderful, I’m so happy to hear that!! Love this recipe. It was easy to make and is absolutely divine. So rich and chocolatey it is hard to believe it was made with simple pantry ingredients. Sorry Americas Test Kitchen but his now replaces your recipe as my new favourite recipe I will make from now on. Thank Tessa for sharing your deliciousness. My pan is 9×9 – should I just reduce baking time a little? What’s your favorite vegan substitute for butter? HI Tessa, love love love your recipe thank you for sharing such a nice recipe!! But i have one problem the bottom of my brownie still kinda sticky like its not coming off the parchment paper very easily.. like some of them are sticking, but for me the texture is perfect already.. Thank you!! Can these baked brownies be frozen? I have been looking for a great homemade brownie recipe and I don’t have to look any further! I made these for my daughter’s high school homecoming dance. Of course, I taste tested before sending them and they are awesome! I’m looking forward to trying them with cranberries (a tip I received from a worker at the cranberry bogs on one of my son’s field trips years ago) and now a family favorite! Thanks for the wonderful recipe! I love baking from scratch and have tried lots of different brownie recipes.Tried this recipe for Thanksgiving yesterday and these were, hands down, the best brownies I have ever made. There is only one drawback, now that is the only thing I will be asked to bring. Thank you for sharing. As a college baker, I’m always looking for recipes that don’t require a ton of tools or idiosyncratic ingredients, but still come out really well. This recipe was super easy to follow, had really easy cleanup, and came out as well as any brownie recipe can come out. I would recommend to anyone that wants to bake beyond boxed brownie mixes. After 60 plus years trying for the perfect brownie, I have my go to recipe!! Thank you!! I always add walnuts. These are perfect for me, chewy and also fudgey. As the author stresses, do not overcook. Thank you for this recipe. I live in Sedona, what adjustments should I make for altitude? I’m at 4200 ft.
Hi Roberta – I’m sorry but I’ve only ever baked at sea level. However at only 4200 feet you should be okay following the recipe as written, unless you typically experience altitude issues. I made a double batch of these brownies yesterday. They are very good – flavor, texture, moisture- they did not disappoint! They are glossy on top, chewy on the edges. Thank you for fine-tuning. WOW….just awesome. I love your recipes Tessa. Just moist, chocolatey brownies. Only thing for me was I had to bake them for 1 hour exact. Turned out delicious. THANKS!! !